Joe Flacco’s performance Sunday in Tampa Bay earned him more than a place in the record books. It also got him AFC Offensive Player of the Week honors for Week 6. 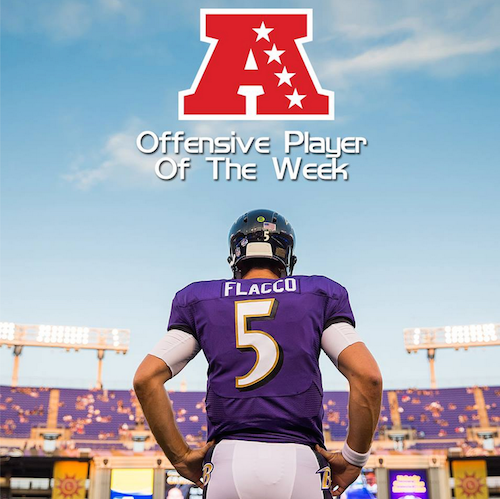 It’s the third time in his career that Flacco has won the weekly honor, given out by the NFL. Flacco finished 21-for-29 for 306 yards and five touchdowns. He posted a 99.7 QBR (quarterback rating) out of 100. Flacco could have put up a lot bigger numbers had he continued firing in the second half, but the Ravens ran the clock out for the most part in a 48-17 victory. Fastest quarterback since the 1970 merger to throw five touchdowns in a game (16 minutes, three seconds). He beat the next closest time by more than 12 minutes. First NFL quarterback to throw four touchdowns in the first quarter of a game since Minnesota’s Tommy Kramer in 1986. Five touchdowns tied Tony Banks (2000) for the most in Ravens single-game history. His 146.0 passer rating set a franchise record and is the NFL’s third-best mark in 2014.